Okay, enough of my playing coy and talking about my “sooper seekrit cooking project.” Time to come clean with the truth: I auditioned for a cooking show. Boston Casting has put out a call for amateur chefs who want to be featured on a reality show with “Hell’s Kitchen’’ host Gordon Ramsay. “We will NOT be considering professional chefs who work or have worked in professional kitchens,’’ the call says. We take that to mean that Boston Casting is looking for participants for Ramsay’s newest show, an American version of “Gordon Ramsay: Cookalong Live,’’ which features the mean chef teaching average folks to make fancy meals. You can find more information at www.bostoncasting.com. I went to the site and read the notice. It turned out that the Globe was only half right. They were looking for participants for a new cooking show that would feature Gordon Ramsay, but it was for MasterChef, a reality-type show along the lines of Top Chef that would feature non-professional cooks. A little web research revealed that MasterChef had completed its fifth season in England and had nothing to do with Ramsay. A little more poking around turned up this page for the US production company that would be creating the show. Despite the association with the producers of The Biggest Loser, I was intrigued by the idea of Ramsay acting as a mentor to would-be professional cooks. It struck me as a move on his part to improve his image here in the States, which he had begun with the atrocious Cookalong with Gordon Ramsay. 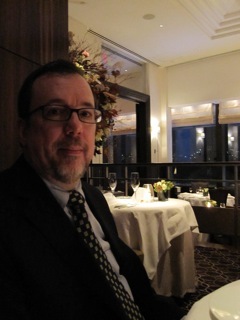 That’s me, David Shaw, about to start my birthday present: dinner at Thomas Keller’s Per Se restaurant (http://blog.belm.com/2009/11/30/birthday-dinner-at-per-se/, http://blog.belm.com/2009/12/01/birthday-dinner-at-per-se-continued/). That dinner was the most recent milestone in a journey that began when I taught myself how to cook in college (http://blog.belm.com/2009/03/31/how-i-learned-to-cook/). Rather than go into exhaustive detail, I’ll point you to selected posts in the blog I started this year that is mostly about food and cooking. What sets me apart from other amateur chefs is my depth of food knowledge, my precision and technique (I’m an MIT graduate), and my passion for good food prepared perfectly. I look forward to hearing from you about the show. Thanks for submitting to the Master Chef Casting Call. We are REALLY looking for a great story: something different, something crazy, something traumatic that maybe impacted or inspired your passion of cooking. I was wondering if you could dig a little deeper and figure out what your angle/your great story would be. I want to consider you, but I need to know more, I need something to stand out. And I mean REALLY REALLY Stand out!! The sooner you get this in to me- the better your chances are for getting an interview! I figured I had received an automatic response, because there was no way anyone could have read all of the blog posts I included in twenty minutes. So I re-sent the photo along with a cut-and-paste of my “How I Learned to Cook” post. That was my story, and I was sticking to it. Email sent, I returned once again to my work. Another twenty minutes later my phone rang. I got the email a few minutes later and downloaded the application and a FAQ. Only then did it hit me: I would have to audition for a television cooking show. It was December 16th. I had less than three weeks to plan my attack, and one question loomed larger than any other. What is my signature dish? It took me two weeks to come up with the answer. You, however, will have to wait only one day. How awesome is this? And how clever of you to throw a cliffhanger in your blog to keep people coming back. I’m looking forward to hearing about how this all plays out…. It’s both awesome and nerve-wracking. If the suspense is killing you, imagine what I’m going through.